The proceeds from this exciting auction go to provide scholarships for the following year's Gathering. Anyone — whether he/she is attending the Gathering or not — is welcome to donate an item to the auction. 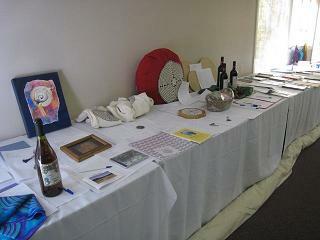 The Silent Auction supports the scholarship fund of TLS. The next Annual Gathering will be in Woodstock, Illinois, and it is due to the generosity of our members that we are able to provide scholarships to support attendance each year. It is not too early to consider what you wish to contribute to the Silent Auction at the 2018 Gathering. If you are unable to attend the Gathering, we will gladly accept items sent by mail. Donations of autographed books, jewelry, art work, small labyrinths, weekend retreat packages, spa vacations, pottery, sculpture, garden items, and other wonderful things, labyrinth-related or otherwise, will be gratefully accepted. Dan Raven returns to coordinate the Silent Auction again this year. Email Dan with questions or donation offering information.